How far international laws of war and related punishment apply to terrorist organizations is something that needs far more attention than presently given. No law will have face value when those not-signatory, non-binding and those that purely exist on their ability to inflict fear and terror does not fall into the radar of international justice and legal punishment. In this context we examine how LTTE had managed to escape 3 decades of international justice for its serial crimes against humanity and war crimes on an entire nation and possibly would have extended to other nations if it had not been militarily defeated. No legal pandit, no UN luminary, no foreign leader and no citizen of the world can deny there were unaware of LTTE’s use of human shields, LTTE’s killing of civilians, LTTE’s use of military equipment amongst civilians, LTTE’s forcible recruitment and force labor, LTTE’s killing of civilians through suicide attacks and the crime involved in demanding that its recruits (forced or otherwise) commit suicide by taking cyanide. Supporters of LTTE have hidden the criminality involved in demanding a person take his/her life through a euphoric fantasy called Eelaam sensationalizing the most horrid of crimes that should have been condemned worldwide and an unanimous decision taken to end safeguarding terrorist groups to advance political agendas. As such laws relevant are Common Article 3 to the 1949 Geneva Convention and the 1977 Additional Protocol II. LTTE filled every criteria of Protocol II – it was involved in a confrontation with the SL armed forces, and as a “dissident” armed force it was under a “command” – Velupillai Prabakaran, they controlled part of Sri Lanka’s territory illegally enabling them to “carry out sustained and concerted military operations”. The fact that LTTE was using Tamil Nadu as its logistics hub and point of gateway adds a “transnational” element since LTTE was operating from across an international border though the country in question India did not “openly” acknowledge so – making Sri Lanka’s armed conflict remain non-international. If LTTE quotes international humanitarian laws through its mouthpieces functioning abroad it is obliged to take accountability for its atrocities under those very same laws. Thus LTTE is obliged to protect noncombatants from collateral damage and be punished for not doing so. This raises the question of why LTTE would choose to hide amongst civilians to make them immune from attack. It goes against all laws of war written or unwritten and LTTE cannot justify why it took shelter amongst civilians and is a severe violation committed by the LTTE. It is evident that whilst total emphasis has been put on the obligations of the attackers (Sri Lanka Military) little or no attention has been paid towards the obligations of the defenders (LTTE) for forcibly taking a large population of Tamil civilians into an area demarcated by Sri Lanka’s Government as the No Fire Zone and commingling amongst the civilians to make them immune from attack. What needs to be remembered at all times is that it is the defending forces (LTTE) that created the conditions to bundle civilians (as hostages or human shields) into an atmosphere where they would be shielded from attack by using civilian installations like schools, places of religious worship, hospitals etc. In both international and non-international armed conflicts the use of human shields is prohibited and the rules are set in the Third and Fourth Geneva Conventions as well as the Additional Protocol I. Additionally, the International Criminal Court declares that “utilizing the presence of a civilian or other protected person to render certain points, areas or military forces immune from military operations” constitutes a war crime. The LTTE has tried in vain to give an excuse that the civilians for volunteer human shields but VHS are completely out of the scope in international humanitarian law. To avoid similar situations IHL should clearly cover VHS through legal regulations and define and prohibit such usage. Article 28 declares illegal the practice of employing human shields under IHL (Geneva Convention IV) “the presence of a protected person may not be used to render certain points or areas immune from military operation”. Additional Protocol 1 to the Geneva Convention – Article 51(7) says “the presence or movements of the civilian population or individual civilians shall not be used to render certain points or areas immune from military operations, in particular in attempts to shield military objectives from attacks or to shield, favor or impede military operations”. This clearly applies to passive and active human shields whether they are voluntary human shields or not. War crimes using human shields was first featured during the war crimes trials by UK military court at Luneberg in 1946, the US military tribunal in Nuremberg in 1948, the Karadzic and Mladic case in 1995 at the International Criminal Tribunal for the former Yugoslavia. We would like to know when the UN has clearly documented reports of LTTE atrocities, when all of the international superpowers of banned the LTTE what has stopped war crimes against this terrorist movement and is stopping it even now since there are plenty of “transnational” LTTE front organizations fighting to lead the next phase of LTTE terror? LTTE is an internationally banned terrorist group, it had challenged the legitimate Government through 3 decades of terror. In international armed conflicts the actors enjoy partial international legality, but Sri Lanka’s situation was a non-international armed conflict with the “other actor” nothing more than an internationally defined, accepted and banned terrorist movement involved in an international network of illegal activities generating enough funds to keep decision makers silent. 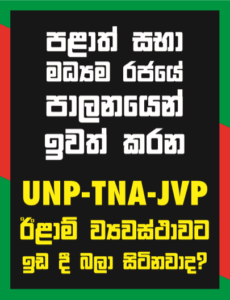 Yet LTTE has no legal international status though foreign parliamentarians may speak atop its fundraising stages and ridicule a legitimate government in a sovereign nation simply because these ridicules have generated votes and catapulted them into political somebody’s. If LTTE is declared illegal and banned every action of the LTTE must be regarded as illegal too. We would like to know why it is not from those who continue to whitewash the LTTE. That Tamil civilians were attempting to escape the LTTE clearly shows that the accusations of genocide and mass killings by the Sri Lankan armed forces is simply a smokescreen and nothing short of ridiculing an achievement no military has been able to do. The Tamil Diaspora, certain sections of foreign parliamentarians, UN officers and the like at mercy of Tamil votes and funds may say otherwise but the reality is that no Government would declare no fire zones if its intent was to kill civilians. The Government declared a NFZ on 21st January 2009 and 12th February 2009 going so far as to use loudspeakers and drop leaflets to direct civilians to move to these areas for shelter. These are all proof to depict how LTTE blatantly violated these zones and moved heavy artillery, mortars and other equipment into the civilian safe zone in order to mingle as civilians and use civilians as human shields or hostages. There is also proof that children as well as elders were forcibly conscripted. Is it not because the UN was aware of these violations of civilian rights that it issued a statement on 16th January 2009 imploring the LTTE to allow civilians to move into government controlled areas without keeping them as “human shields”? Let us also not forget that the LTTE held captive UN aid workers (2 expats and 13 local staff) and released them on 30th January only after international pressure. Would those pointing fingers care to explain why Tamil civilians would attempt to escape their “savior” and “sole representative” the LTTE even braving LTTE indiscriminate firing to enter government-controlled areas? These are all very clearly documented and hold greater weight than those throwing stones or singing from abroad. Their inflated egos are such that they cared little for their own people over their pompousness to keep alive a terrorist movement that served their own self-interests sacrificing the poor and lowcaste Tamils who had been always used as cannon-fodder for 3 decades….is this the eelam that these civilians were to continue living in? If the no fire zone or civilian safety zone was meant only for civilians – what were LTTE terrorists including its leader doing inside this zone when as an armed terror group it should have been facing the military instead of using Tamil civilians and hiding amongst them? This is a clear violation of international laws and war ethics especially when LTTE was using the very civilians who have been used as a slogan for international propaganda purposes to warrant acceptance internationally and to allow it to camouflage its terrorism. If the Sri Lankan military had been indiscriminately firing at the no fire zones since 21st January 2009 how did 11,000 LTTE combatants live to surrender themselves to the military and why would the elimination of the LTTE have taken till May 19, 2009 to complete, why would 5000 or more soldiers sacrifice their lives when going by the genocide and mass killing argument the Sri Lankan military could have blown the entire area to smithereens? If LTTE was firing from within the civilian safe zone and the army retaliated with fire who is primarily at fault? Returning fire is a perfectly legitimate action. Moreover, let us not forget the LTTE were not always in uniform and functioned disguising as civilians. It was one of these civilian-imposters that blew herself up at a makeshift civilian reception center killing scores of Tamil civilians as well as a number of female military soldiers who had been attending to the food and medical needs of the civilians who had escaped the LTTE – what type of cowardice tactic was this? Moreover, the Government of Sri Lanka was not required to supply food or medicines to areas controlled by the LTTE nevertheless despite threats to life Government Agents supplied food and medicine throughout to areas of the North including the final stage of the war. Let it also not be forgotten that civilian estimates were purposely inflated in order to use these food and medicines as buffer stock for the LTTE and their families whilst non-LTTE families were left to drink water – if they were lucky! It must be noted that the Sri Lankan military followed all principles in all targets – the commander evaluated the mission, time available, military advantage, intelligence at hand, assets available to target, political ramifications of striking target as well as the collateral damage. Moreover, the army had been given orders to adhere to a “zero civilian casualty” policy. Article 33 is perfect to describes Sri Lanka’s situation – it was ONLY AFTER suffering 3 decades of terror, countless local and internationally mediated ceasefires, negotiations, draft resolutions which LTTE refused and unabated killing spree did the Sri Lankan Government decide that force had to be used – that force resulted in a humanitarian military solution that ended Sri Lanka’s 30 year conflict in just 3 years. This included several appeals made in early 2009 by Sri Lanka’s President to the LTTE to lay down their arms and surrender to Sri Lanka’s military. Three years after Sri Lanka is still trying to put the story straight not because stakeholders to the conflict in Sri Lanka are not aware of the truth, it is because they need to continue the façade that gave them livelihood while for others it continues to believe that terrorism can deliver political goals. Where international organizations have failed nation-states is by misusing their office, manipulating international laws in place and using every cunning to throttle a nation whilst totally ignoring that its priority should be to noose illegal actors like LTTE terrorists and their associated entities and individuals. We look forward to the day sanity prevails and hypocrisies end.